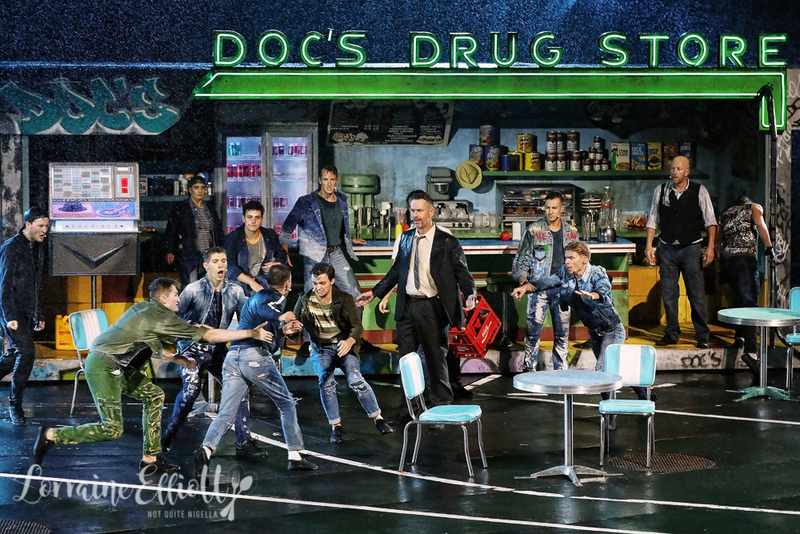 It's time of the year again for the spectacular Handa Opera production by Opera Australia and this year it is a more modern offering in the form of West Side Story. 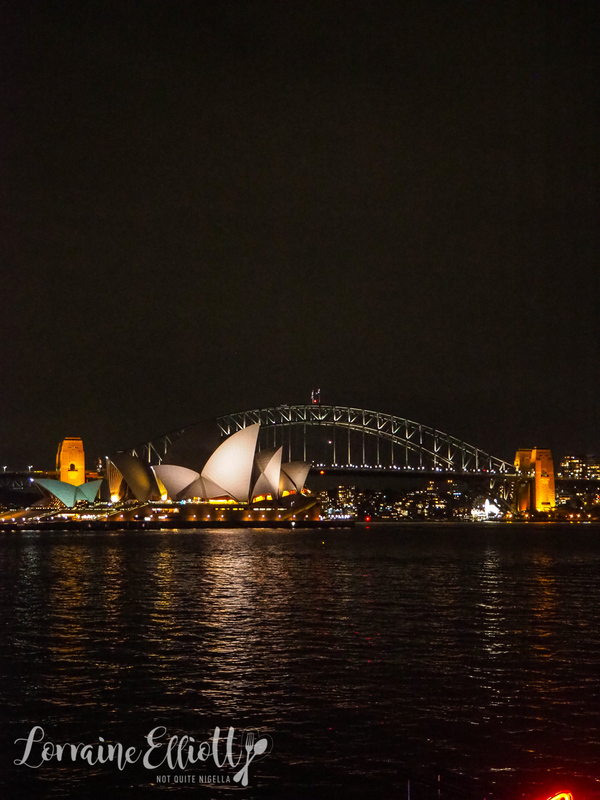 Sydney Harbour is the host for this annual event with its spectacular back drop of the Sydney Harbour Bridge and Sydney Opera House. And the story of two rival gangs the Jets (Anglo Americans) vs the Sharks (Puerto Ricans) is now more relevant than ever. The 1950's set version of Romeo and Juliet and its doomed lovers is a big departure for Opera Australia and seems rather prescient given the current political situation in the United States. But that wasn't a deliberate choice. 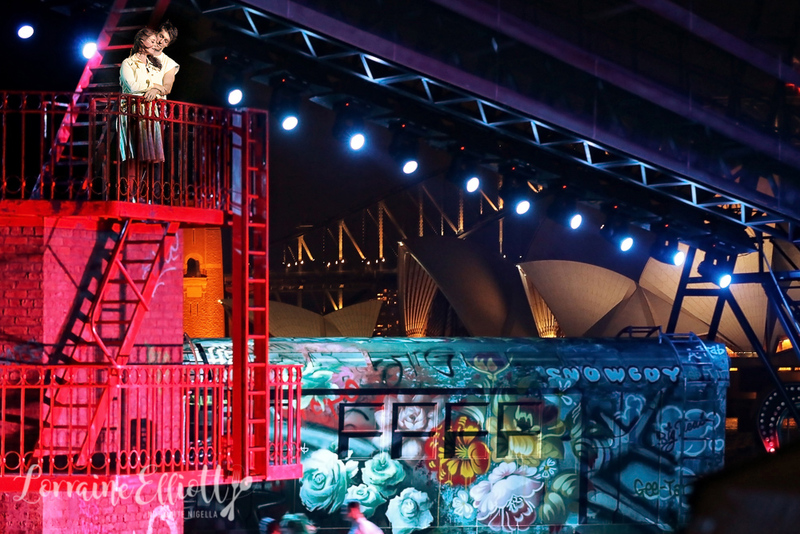 Opera Australia says, "(Opera Australia’s Artistic Director Lyndon Terracini) has been trying to get the rights for years, negotiations have been ongoing with the Bernstein estate and finally they came through. 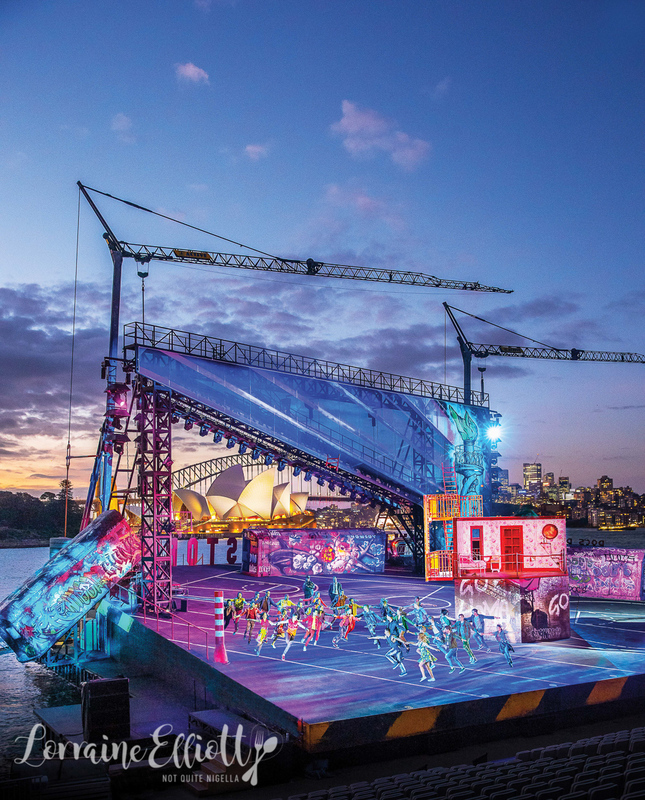 The decision to do West Side Story was entirely due to its brilliance as a production, it’s broad audience appeal and knowing it would adapt so well to the big outdoor stage on Sydney Harbour. There is no tie-in with current tensions but there is a conscious knowledge that sadly, it is as relevant today as it was 60 years ago." 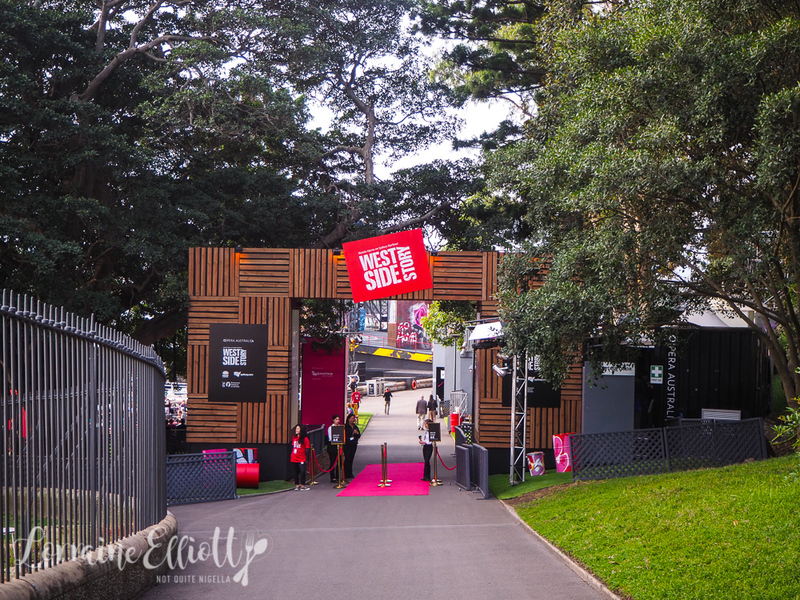 The outdoor production is Opera Australia's 8th one and by now you'd think that the set up might be straightforward albeit not an easy one. It takes 150 construction workers 15 days to build the pop up site. 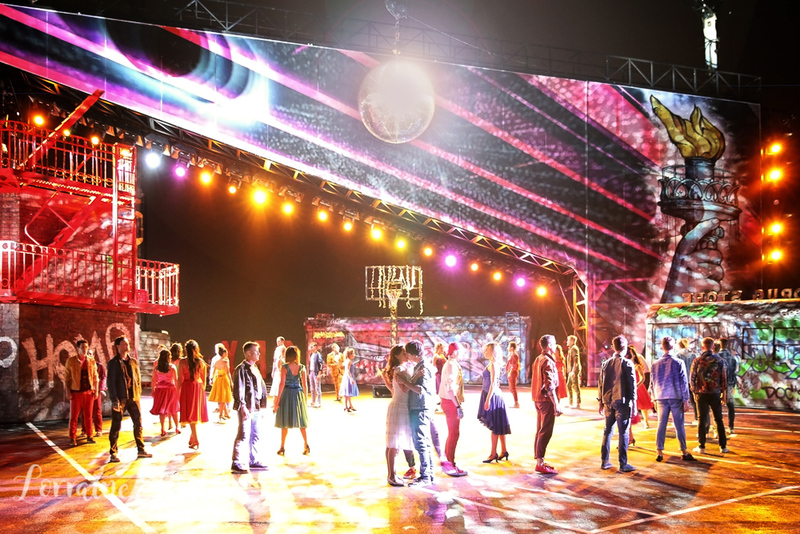 The cast rehearsed for 3-4 weeks in Homebush on a basketball court before having 1 week's rehearsal on the actual stage. The stage can support up to 150 tonnes. And what is underneath the 3,000 seats in the grandstand? It's nine dressing rooms! West Side Story has a big focus on dance and the main challenge the dancers faced was the raked sloping stage. Finding a space as large and similar to rehearse was a challenge prior to the actual stage being in place. The dancers only had one and a half week for rehearsal on the actual outdoor stage to get used to dancing and running on an angle. Warm up also proved a challenge as there wasn't a large enough warm up space so instead dancers warm up on the actual stage as guests are arriving. All day I've been busy checking the forecast for the weather because the Handa Opera is an all weather production. Ivy and I arrive and make our way to a pre-show dinner at The Platinum Club. There is a three course meal on offer with matching Tyrell's Wines for $245 per person as well as a buffet choice for $130 per person. 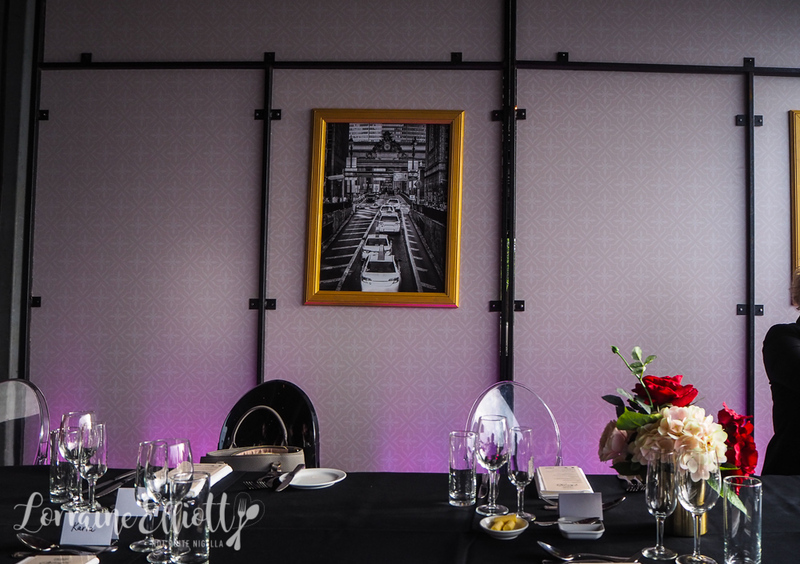 Usually Fresh Catering theme it towards the production and although they do say that it is Latin themed, we can't really see that reflected on the Platinum club menu although it is more apparent in the more casual dining spaces. There are arepas and beef sancocho in the Northern Cantina while the Southern Cantina has American diner style food with burgers and fries. We take a seat for dinner as the sun makes it way across the sky. 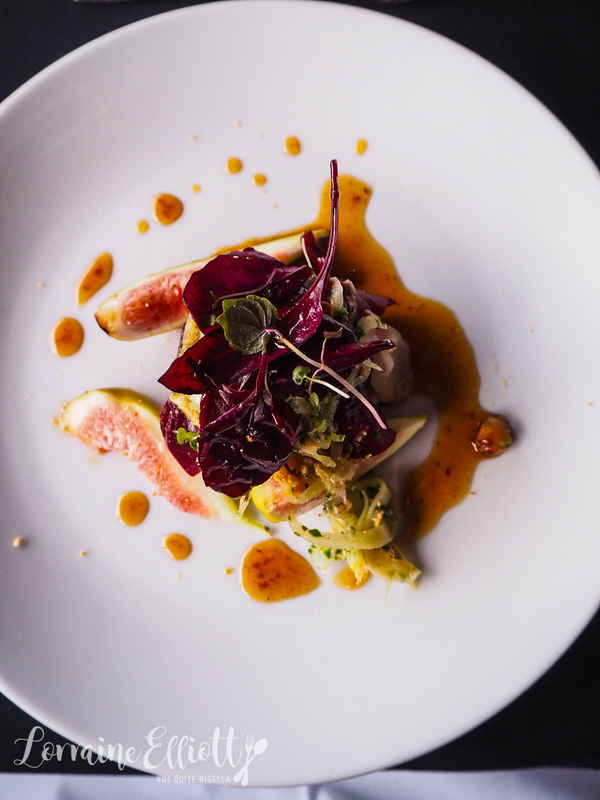 My favourite entree is the salt baked roasted beet salad with hung sheep's curd with fresh white fig slices, hazelnuts and a shaved fennel salad. It's has some lovely textures and the sweetness of the beetroot pairs well with the rich sheep's curd. 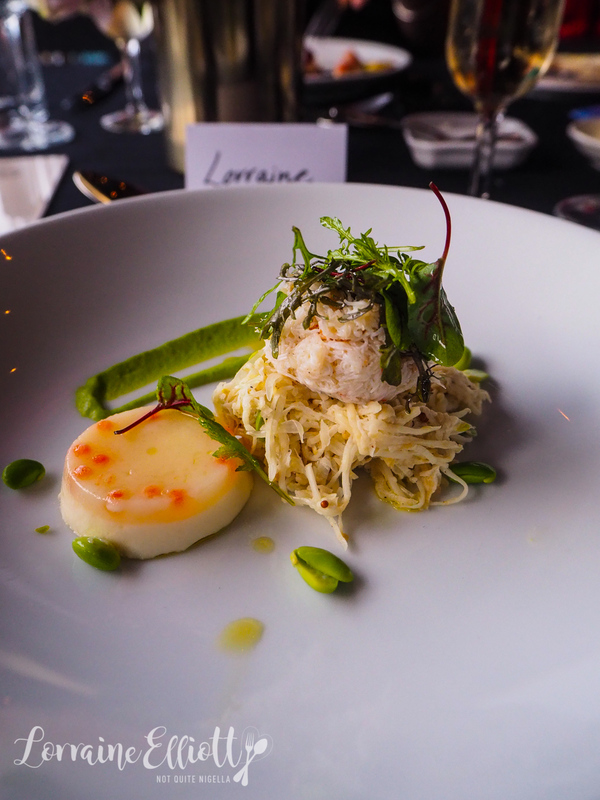 I also enjoyed the spanner crab and finely shaved celeriac salad. The jellied smoked roe and bonito flan is quite mild in flavour and I think I expected a stronger flavour from this. There are also pickled mushrooms and pomelo mixed in with the crab and spring peas to the side. 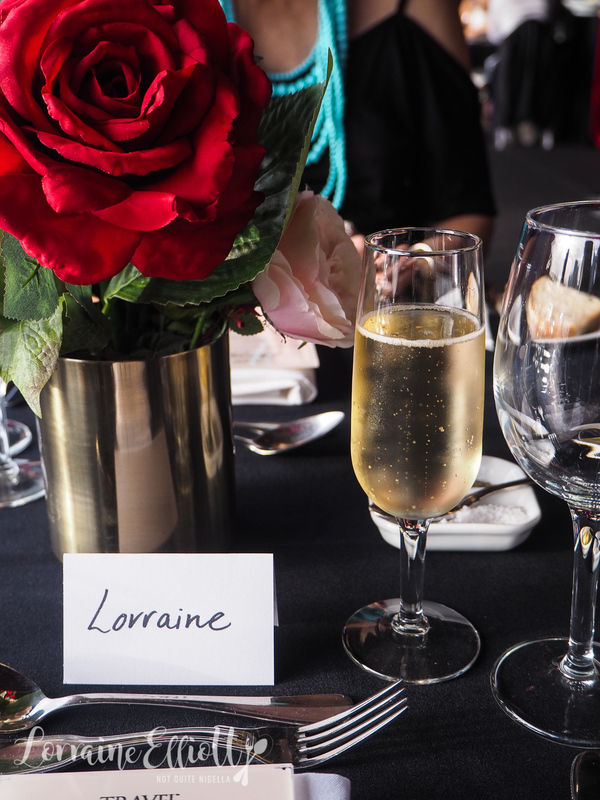 Wine service is a bit slow and we have to ask for the wines to be poured for us when each course arrives. Then come the mains. 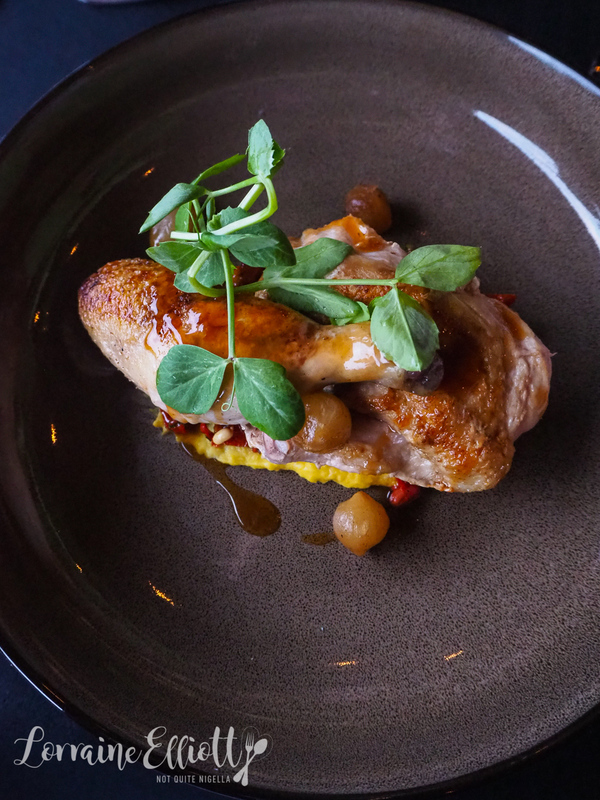 The first is a succulent Burrawong chicken with sweetcorn puree, a charred red capsicum salsa, sprouted grain and a charred baby onion jus and tiny roasted onions. This is good once you add a little seasoning to this. My favourite main is definitely the slow roasted beef rump cap which is tender and melts in the mouth. 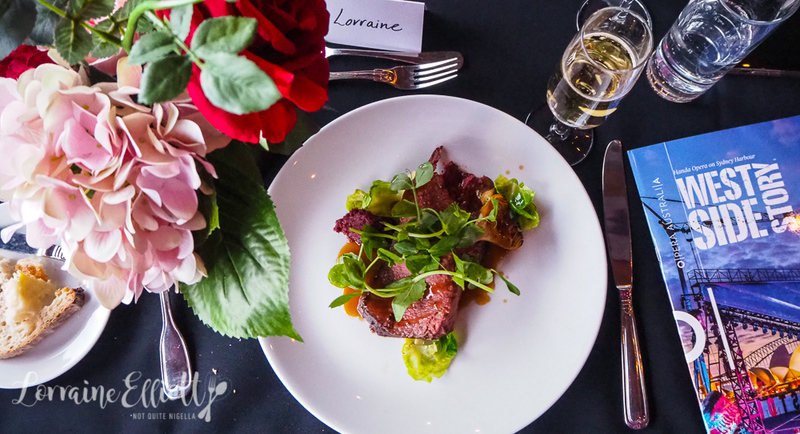 It is paired with a Nicola potato puree, roasted sunchokes and greens. I also like the little surprise of red wine cabbage puree. There is also a vegetarian option which is a mushroom and cauliflower pithivier but we didn't try this. There are two desserts to choose from. 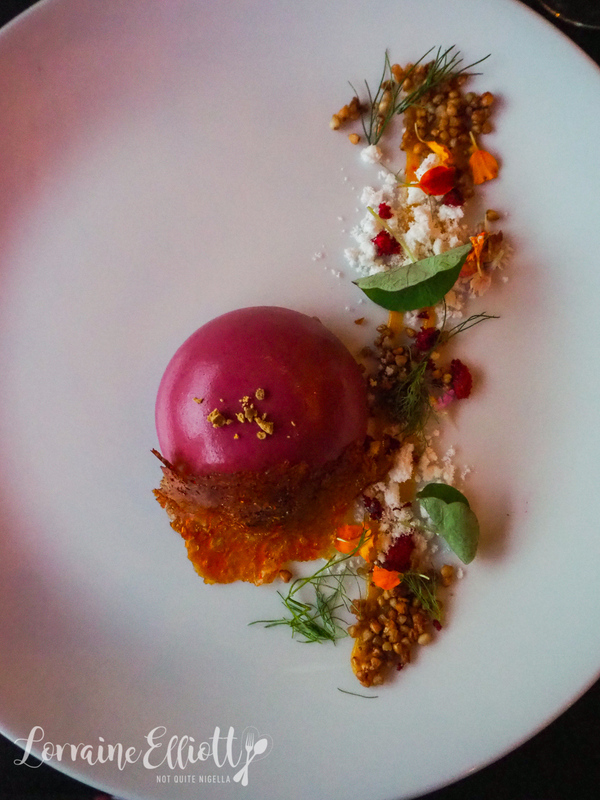 The first is a chocolate mousse dome with roasted red plums, crunchy buckwheat groats, urban honey, bee pollen and a dehydrated fruit leather to the side. Ivy likes this dessert while I go for the cheese platter below. 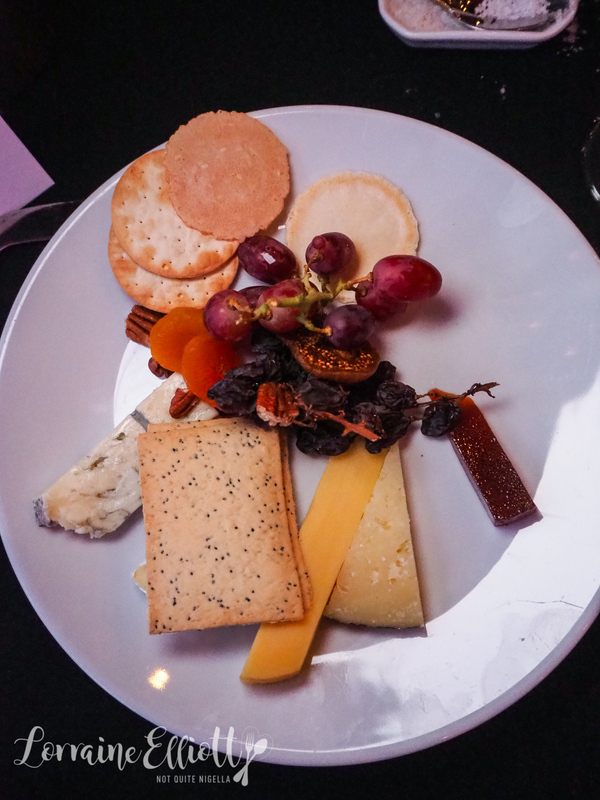 There are four types of cheese including a Manchego Mature Curado 12 month D.O.P, Gorgonzola Dolce Latte and Frico Dutch Gouda served with quince paste, fresh and dried fruit and lavosh. I'm an absolute sucker for gorgonzola dolce with quince paste and lavosh. We then rush downstairs to our seats. "Is this going to be a musical or an opera?" I whisper to Ivy. "I have no idea" she answers. Indeed in the first 15 minutes of production with its elaborate dance sequences and choreography there is no singing at all and we wonder how the Opera Australia audience is reacting to this. The show has had some controversy - the casting was criticised for a lack of diversity which is a genuine issue that sadly and frustratingly happens all too much in Australia. It's a straightforward story and being sung in English makes it a touch easier to follow (I find opera subtitles often lack depth and substance). 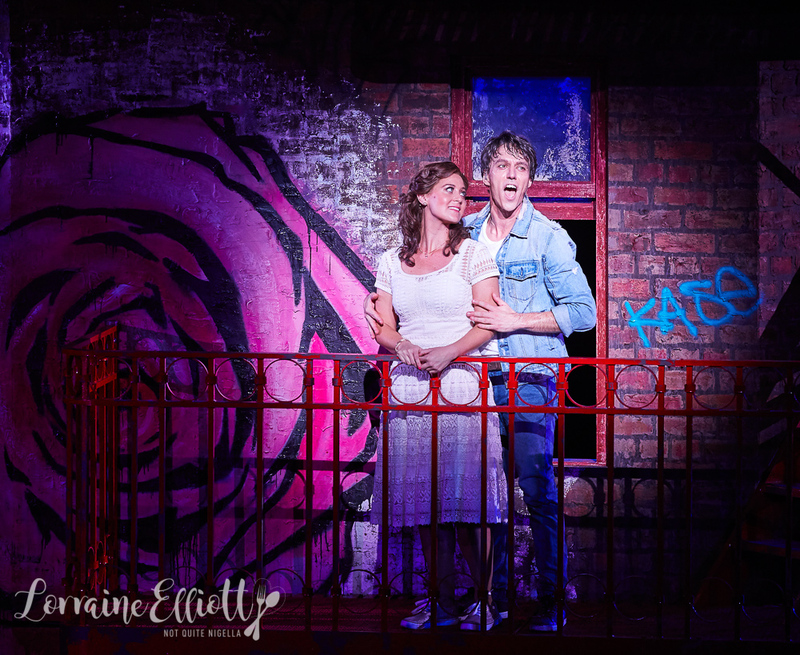 There are so many songs that are familiar-we both hadn't seen it as a musical and didn't realise that so many songs came from West Side Story so unlike the opera, you can actually hum along. Interestingly many of the songs in West Side Story make use of the devil's tritone, a musical interval composed of three adjacent whole tones that is used to create tension. Two tones are played while your ear awaits to hear the third which you do to much relief. The way they say "Ma-ri-a" is a prime example. Some songs segue into opera but it's more musical than opera. The first act goes for 1.5 hours with a 30 minute interval and there are fireworks involved but I don't want to spoil it for you. We head back to the Platinum Club for drinks before taking our seat for the final 45 minutes. And apparently we are lucky because while there are some tiny fairy like drops of rain, opening night last week involved downpours! So tell me Dear Reader, do you prefer musicals or opera? Do you have a favourite musical? 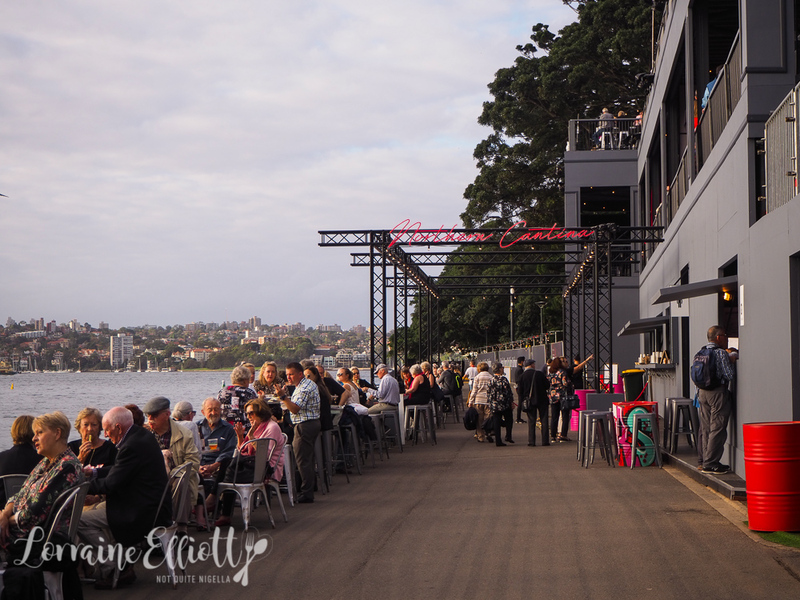 NQN and Ivy were guests of Fresh Catering and Opera Australia but all opinions remain her own. restaurantJamie Oliver, Food Revolution Day and Cooking Naked! featureNot Quite Nigella wants to hear from you! feature Not Quite Nigella wants to hear from you!